Student Materials Set: Bacteria is rated 4.0 out of 5 by 2. A must for your science fair projects. Design your own experiment. Basic materials for the individual student or 10 groups in a classroom to culture a variety of bacteria. 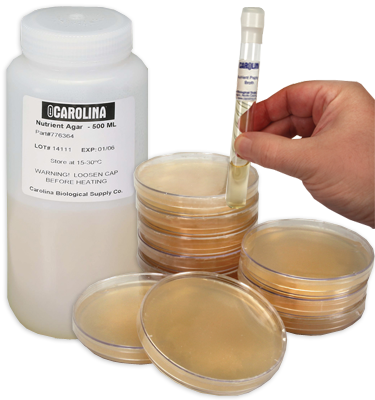 Collect them from the environment or select a particular bacterium for your project. Rated 3 out of 5 by Shanz from Relatively easy to use I was a bit disappointed in this kit. Two bottles of media was only enough to cover 11 plates, even being poured conservatively. They were still being poured by a first-timer. We didn't get to do the experiment we'd planned out with the 20 plates provided. Also, the booklet shown is not included. Instead you get a card directing you to the PDF version. I'm all for saving trees, but it was very inconvenient. Rated 5 out of 5 by Kathy24 from Terrific for growing bacteria My students get so involved in this project. We like to see where bacteria is hanging out like the sink, the drinking fountain, our desks. They want to test everything. This also makes a great scientific method demonstration.